When is a coffee shop not a coffee shop? Well I guess the answer is if it is in Amsterdam. No? 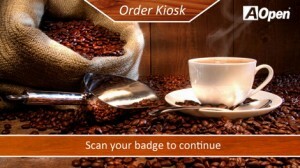 At #ISE2012 this year AOpen will showcase a hospitality environment in the form of a café with an ordering kiosk and order registration system for the barista to make your cup of coffee of choice, using an AOpen WarmTouch multi-touch panel PC to punch in your order. The all-in-one multi-touch panel PC has a 21.5 inch display with a LED backlit panel. The built-in PC is based on the AOpen Digital Engine technology including Intel 2nd generation Core i3 Processor and Dual Channel DDRIII memory for high performance. The specially designed Z-bracket for easy mounting into kiosks is included in the package. The WarmTouch series is complemented at the show with a number of new products; including 15 and 18 inch touch-displays. All have a sleek design with a flat and thin back panel so it’s ready for easy and quick installation. The IP54 grade front panel is water and dust resistant and therefore ideal for placement in rough environments such as retail and hospitality. AOpen’s (not a coffee shop) can be found at #ISE2012 in hall 10 stand N129. This entry was posted on Tuesday, January 24th, 2012 at 07:28 @352 and is filed under DailyDOOH Update. You can follow any responses to this entry through the RSS 2.0 feed. You can leave a response, or trackback from your own site.